Facebook just announced a huge expansion to their Menlo Park campus, and the company has commissioned Prizker-Prize winning starchitect Frank Gehry – best known for his shiny, titanium-clad icons of blobitecture – to design the expansion. Even more surprising is that we’ve seen the designs, and so far they don’t appear to include Gehry’s trademark incomprehensible piles of titanium curves. The proposed design is quite eco-friendly, with a massive park-like, tree and grass-lined green roof featuring benches and a walking trail! In addition, Facebook submitted proposals to the city to allow its planned new workforce of 6,000 to travel between old and new campuses to via a tunnel designed for pedestrian and bike traffic. Perhaps an eco architect like Bill McDonough might have been a better pick to design the giant green roof, but it seems Facebook was going for icon status here, as few architects are better known than Frank Gehry. Zuckerberg’s team have made few changes to the former Sun Microsystems building they have occupied since their move in last summer. This area, the East Campus, cover 57 acres and about 1 million square feet of office space. The new plan proposes the creation of a 22 acre west campus, which will be able to house their proposed hire of over 6,000 people in the next six years. 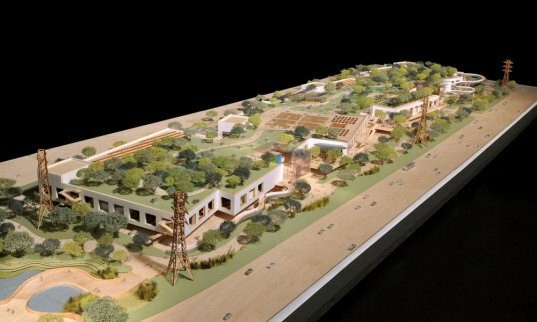 In Gehry’s architectural models of the West Campus plan show a green roof extending over all of the planned building space. The plan will also conform to Menlo Park’s the Water Efficient Landscape Ordinance which requires that turf area shall not exceed 500 square feet. In the non-turf areas, the ordinance states that at least 80% of the plants be native plants, low water using plants, or no-water using plants. The roof top will be peppered with eating cafes and kiosks, such as sushi bars. More than a third of the new workers will be engineers, and Everett Katigbak, Facebook’s environmental design manager, is making sure the new building takes this into account. “At every step of planning the new building, Frank has taken into account our engineering culture” says Katigbak in a Facebook post. “It will be a large, one room building that somewhat resembles a warehouse. Just like we do now, everyone will sit out in the open with desks that can be quickly shuffled around as teams form and break apart around projects.” The new offices will also include cafes, mini-kitchens, and comfy break spaces. The tunnel connecting the two campuses can be seen in site plans submitted in 2011 to the City of Menlo Park. The path creates a transit route for people and bikes underneath the Bayfront Expressway. Frank Gehry is such a big name in architecture that inevitably, his buildings all seem to become ‘icons’, so we expect Facebook is hoping for a Bilbao moment here with their new campaus. Though Gehry is best known for his swooping, technically challenging, titanium-clad facades, we’re noticing that his more recent works heavily promote bioscaping. The Panamanian Museum of Biodiversity, L.A.’s Grand Park, and Chicago’s Millennium Park all capture Gehry’s uniqueness of form, consideration for the native plant-scape, while creating spaces that draw people outdoors. If Gehry’s team applies the same attention to detail to the Facebook West Campus, future Facebook employees should be happy campers. Strolling on the roof park of your office building while nibbling on sushi sounds pretty idyllic! What do you think Inhabitat readers? 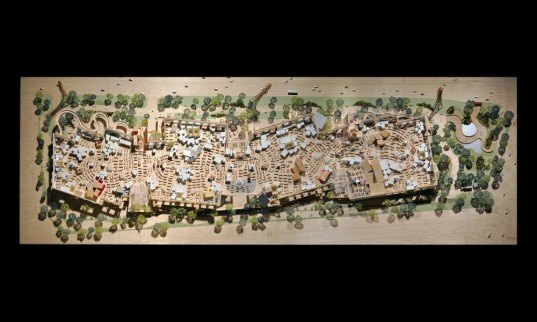 Are you excited about a Gehry-designed Facebook campus? It is really wonderful to know that Mark will be helping with creating Modern Architecture communities that goes in harmony with nature. From the plan itself, I can already tell that they gravitate toward unique, one of a kind works of art. 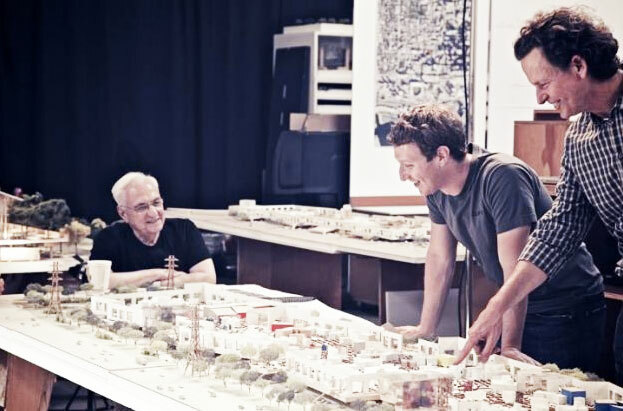 Facebook just announced a huge expansion to their Menlo Park campus, and the company has commissioned Prizker-Prize winning starchitect Frank Gehry - best known for his shiny, titanium-clad icons of blobitecture - to design the expansion. Even more surprising is that we've seen the designs, and so far they don't appear to include Gehry's trademark incomprehensible piles of titanium curves. The proposed design is quite eco-friendly, with a massive park-like, tree and grass-lined green roof featuring benches and a walking trail! 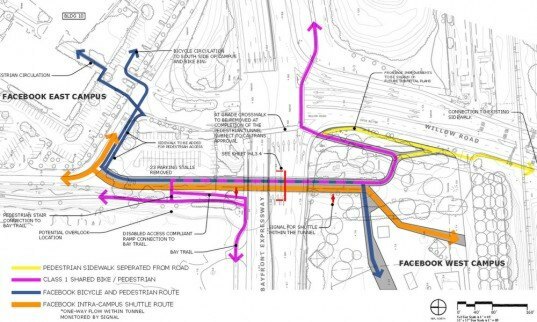 In addition, Facebook submitted proposals to the city to allow its planned new workforce of 6,000 to travel between old and new campuses to via a tunnel designed for pedestrian and bike traffic. Perhaps an eco architect like Bill McDonough might have been a better pick to design the giant green roof, but it seems Facebook was going for icon status here, as few architects are better known than Frank Gehry.